Many children from Sunland Hospital were buried at this cemetery, and there are creepy sections within called “Baby Land 1” and “Baby Land 3”, etc. which house nothing but infants and children under five years of age. Visitors to these sections hear music box tunes and sometimes children’s laughter. Others feel ghostly hands touching them or pulling at their clothing. I took a hosted tour here and did not expect much more than some occasional boos and ahs from all the people on the tour scaring each other. Turned out, I experienced a heck of a lot that night. Weird sights, smells and feelings. Got strange pictures and, in one area where a crypt is said to be guarded by a ghost dog, you can smell wet dog. Very pronounced. I’m researching locations to go on investigations and was wondering if you could give me general areas for this crypt you talked about and any other hot spots there may be in the cemetery. Was here with a friend as a teenager and was simply walking around viewing the area on a sunny day. 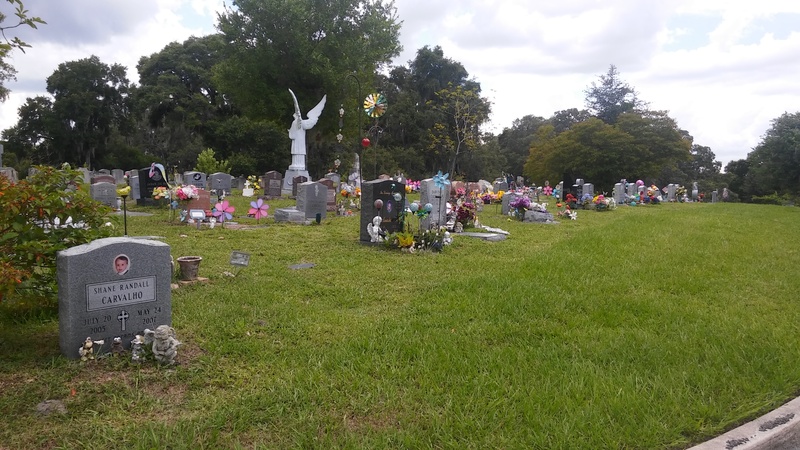 This was a short time after hurricane Charlie had damaged many of the headstones, and upon viewing a section of old and crumbling children’s graves I felt a wave of despair that seemed a little unusual. Seeing the graves in bad shape is of course sad, but I actually got sort of a lump in my throat. After moving on we continued walking around the area for an hour or so, during which I developed a sort of strange tingling/itching sensation on my left arm below the elbow. I scratched at it so often that my friend commented on it, but though I was wearing long sleeves I just assumed it was a bug bite and thought nothing much of it. It wasn’t until we got into the car and pulled away from the cemetery gates that I noticed the feeling fade and totally disappear almost immediately. Yet the sensation had been persistently bugging me for an hour! A couple years later, I brought my younger cousin to check out the cemetery and she surprised me about half an hour into our walk by exclaiming “Something just touched my arm!” in total seriousness. I laughed it off at first until she actually asked if we could leave. I honestly hadn’t shared my experience with her. Not totally sure what to think, but it’s a lovely place and for me the sensation wasn’t threatening. Just strange! Was there today and didn’t have anything happen. I took a picture of babyland 3.